Important notice – campus change This course will relocate. Applicants and current students will be updated in due course. The BSc Hons Diagnostic Radiography & Imaging programme is designed to provide vocational education at undergraduate level for careers in diagnostic radiography. The BSc Hons Diagnostic Radiography & Imaging course is a full-time programme of study of three-years duration. On completion, successful graduates are eligible to apply for registration under the protected title of "Radiographer" or "Diagnostic Radiographer" with the Health and Care Professions Council (HCPC), the statutory regulatory body responsible for ensuring continuing standards of education, training and professional proficiency in order to protect the public. The course is also recognised and endorsed by the Society and College of Radiographers, both students and graduates of the programme are eligible to apply for membership of the Society of Radiographers. The University regularly ‘refreshes’ courses to make sure they are as up-to-date as possible. The University calls this process 'academic revalidation’. This course is currently being ‘refreshed’, with changes being put in place for students entering from September 2018 onwards. For the most up-to-date course/ module information, please contact the Course Director. Diagnostic radiographers undertake imaging examinations essential to the diagnosis, treatment and monitoring of disease and injury. This can also include the examination of apparently healthy individuals as part of a screening programme. As a diagnostic radiographer you will be required to evaluate the diagnostic and technical quality of images whilst at the same time recognising normal and abnormal appearances. Apart from the application of X-rays (including CT scanning), diagnostic radiography embraces ultrasound, nuclear medicine, magnetic resonance imaging and other developing technologies. It is important to note that radiography involves working with ill and vulnerable patients, and that patient care is as vitally important as the technical aspects of the role. The BSc Hons Diagnostic Radiography & Imaging course is a full-time programme of study of three-years duration leading to the award of an Honours degree with eligibility for registration with the HCPC. The course is also recognised by the Society and College of Radiographers, both students and graduates of the programme are eligible to apply for membership of the Society of Radiographers. Three years, full-time including eight week long clinical placements each summer between Year 1 and 2 and between Year 2 and 3. Academic semesters consisting of 12 weeks of on-campus contact hours: level 4 averaging 20 hrs /wk, level 5 averaging 16 hrs/wk, level 6 averaging 12 hrs/wk. The total effort hours per semester (contact time and self-directed study) is 600 hours, averaging 40 hrs/wk. Clinical Placement modules which are carried out in various hospitals, approved for clinical education and training of students throughout Northern Ireland. Monday to Friday, 9.00am to 5.00pm, 37.5 hrs/wk. In addition, there is a requirement to complete a minimum of 40 hours clinical experience outside of normal working hours.It should be noted that Placement 1 and 3 occur during the summer months. This module provides opportunities to learn in an interprofessional context. Students will acquire skills for both academic and practice based learning. It will provide them with an opportunity to acquire knowledge and skills on issues relating to professional practice and personal development within a supportive environment. This module will enable the student to gain knowledge and understanding of the physical principles and capabilities of X-ray equipment and image formation, essential for safe and competent diagnostic or therapeutic radiography practice. It provides a fundamental understanding of the principles and describes the design and use of diagnostic imaging and radiotherapy treatment equipment and associated information technology such as PACS, RIS, EPR and RMS. This module introduces the student to the essentials of Human anatomy and appendicular skeleton. The skills and knowledge gained will facilitate the understanding of skeletal anatomy and interactions in relation to normal and abnormal appearances in radiographic images. This module will introduce the student to first patient contact and the skills and understanding required to produce high quality routine radiographic images of the appendicular skeleton. This knowledge gained will prepare the student for orientation placement. This module will also cover the safe clinical application of techniques in diagnostic radiography including patient care, health and safety and radiation protection. This module will enable the student to gain knowledge and understanding of the digital image, image formation and associated quality assurance essential for safe and competent diagnostic radiography practice. It provides a fundamental understanding of the principles and describes the design and use of digital diagnostic imaging equipment and associated information technology such as PACS, RIS, EPR and RMS. This module allows the student to develop an understanding of the human anatomy, physiology pathology and radiographic technique of the axial skeleton, shoulder girdle, chest and abdominal cavities as well as the recognition and understanding of the disease processes. The student will also develop an understanding of selection of equipment, imaging techniques of the pelvic girdle and axial skeleton and the use of appropriate exposure parameters. This module will prepare students for the clinical environment. The students will be introduced to the professional behaviour and the roles and responsibilities of the radiographer. General patient care and patient care related to specific patient groups will be addressed. Students will consider how to adapt radiographic practice for each special group to optimise delivery of care. The module will discuss legislation and guidelines relating to the clinical environment including radiation protection, patient communication, consent and confidentiality. This placement will enable the student to develop his/her professional and caring skills within the hospital environment and to work as a member of the healthcare team. He/she will acquire the skills necessary for the radiographic examination of the abdomen, respiratory and skeletal systems. Experience will also be gained in the areas of image processing, clerical management and nursing procedures. The module develops research knowledge and skills for using published evidence to inform practice and for designing and conducting research and clinical audit post-registration. The focus is on research design and qualitative and quantitative methods appropriate for healthcare research. A series of lectures and seminars will develop research knowledge and its application in using and producing research evidence. Workshops will provide practical experience of research activities including data analysis. In addition, course specific seminars will provide guidance on the development of a research idea and presentation of an outline research proposal. During this placement the student will perform radiographic examinations and undertake duties of increasing complexity as he/she gains experience and acquires further skills in the imaging process. The student will also gain competence in adapting procedures and examinations to suit the physical and psychological condition of the patient. 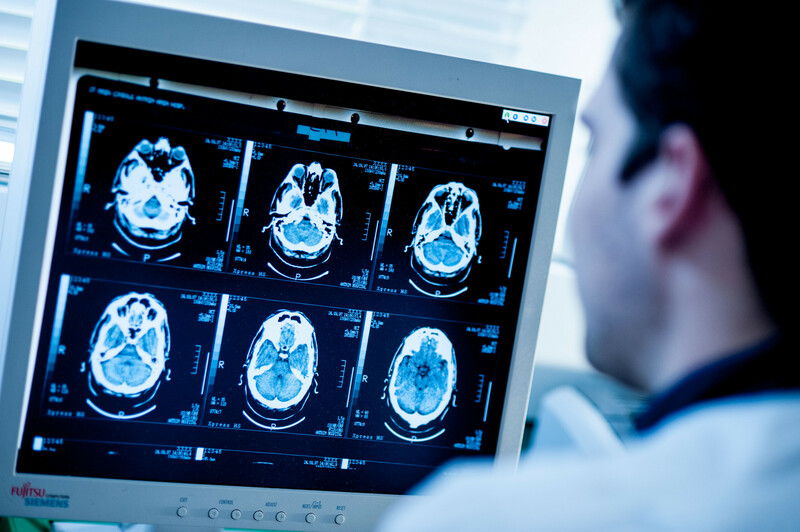 This module provides an understanding of the key concepts of science, technology and safety relating to the specialised imaging modalities currently used in diagnostic imaging, as required by Radiography practitioners. Participants will develop an understanding of digital image quality and effective image manipulation. This module covers homeostasis, anatomy, physiology, pathology and the specialist imaging diagnostic imaging including interventional procedures of the urinary and reproductive systems including mammography. The student will also gain knowledge of the use of contrast media and pharmaceuticals commonly used in these diagnostic examinations and interventional radiological procedures. Imaging of the Cardiovascular and Respiratory systems. This module gives the student a sound knowledge of the structural organization of the human body and a comprehensive understanding of the anatomy, physiology and pathology of the cardiovascular, respiratory and lymphatic systems. This module extends the students' knowledge of the practice of diagnostic radiography to more specialised techniques including interventional. The development and use of the different imaging modalities are evaluated especially in relation to the acutely ill patient. This understanding of anatomy, physiology, and pathology is essential to enable the student to perform effectively in the clinical setting. This module covers anatomy, physiology, pathology and the specialist imaging diagnostic imaging including interventional procedures of the dental, gastrointestinal and hepato-biliary, systems. The student will also gain knowledge of the use of contrast media and pharmaceuticals commonly used in these diagnostic examinations and interventional radiological procedures. This module will facilitate and enhance the student's appreciation of their role as a practising radiographer and explore opportunities for role development. The module will examine the importance of entrepreneurial skills and health promotion activity in the professional setting and examine their application to radiography or radiotherapy. Mechanisms to ensure the protection and safety of the patient and service users are examined. In this module students will develop research skills by undertaking a research study on a topic related to practice. Each student, with support, will have an opportunity to undertake one of the following types of research project: (i) a systematic critical review to inform practice;(ii) a research protocol involving the design of a research study or health promotion activity or (iii) a research report involving the collection and/or analysis of data to produce evidence to inform practice. Lectures and clinics, supplemented by online material, will provide the theoretical knowledge and guidance required to undertake the research task. Workshops will provide support for practical skills such as systematic searching for literature, using critical appraisal tools and data management and analysis. This module provides an element of choice in facilitating the opportunity for the student to participate in either an elective placement of their own choice, or alternatively an international exchange network comprising European partner institutions as part of the ERASMUS Radiography Group. The placement is intended primarily to be work-based to enable development and honing of skills prior to exiting the programme as a qualified practitioner. Both experiences will enable the student to appreciate existing variations in practice that exist between departments including protocol and procedures, as well as affording the student the opportunity to gain further skills with different types of diagnostic imaging equipment. able to demonstrate evidence of progression in his/her practical ability and image recognition skills. The student will also be introduced to undertaking imaging examinations in the ward and operating theatre. This module aims to consolidate the student radiographer's previous learning from both the academic and clinical environment. It is designed to ensure the student radiographer aspires to levels associated with practitioner standards. It encourages the student to assimilate learning across modules and enable them to make sound professional judgements and subsequently promote effective clinical practice following registration with a regulatory body. This module provides an understanding of the anatomy, pathology, physiology and diagnostic and therapeutic imaging of the nervous system, endocrine system and special senses for diagnostic radiography practitioners. The student will be given the opportunity to develop confidence and expertise in all skills required for professional practice, working with trauma patients gaining further experience in the modification of techniques to suit the clinical presentation of the patient. He/she will be encouraged to use initiative in situations of varying complexity performing professionally and efficiently with all grades of the multi-professional health care team. The A Level requirement for this course is BBB to include a grade B from one of the following: Maths, Physics, Chemistry, Biology. Double Award Life & Health Sciences (grade BB) or Double Award Applied Science (grade BB). Overall BTEC Level 3 QCF Extended Diploma with profile DDM (to include a unit profile of 9 distinctions) in a relevant science based BTEC. Applicants must also meet the GCSE science requirements for the course. BTEC Level 3 RQF National Extended Diploma with profile DDM. Applicants must also meet the GCSE science requirements for the course. Overall Irish Leaving Certificate Higher Grades H3,H3,H3,H3,H3 to include English, Maths, Physics (Physics with Chemistry acceptable), plus one of Biology or Chemistry. Pass with an overall mark of 65%, including 65% in each level 3 module to include physics and one of biology or chemistry. NICATs maths (25 credits) or maths 1 & 2 or GCSE grade C maths. GCSE Profile to include English Language and Mathematics at grade C/4. Plus GCSE Physics grade C/4 and one of Biology or Chemistry grade C/4 or GCSE Double Award Science grade BB/66. Essential/Key Skills in Application of Number is not regarded as an acceptable alternative to GCSE Mathematics. Satisfactory performance in the HPAT-Ulster selection test is also required. More information on the Health Professions Admissions Test (HPAT) can be found at www.hpat-ulster.acer.org Please note that there is a cost to undertake the test. Pass HND with overall Merit to include 60 distinctions in level 5 credits/units. Pass HNC with overall Distinction to include 90 distinctions in level 4/5 credits/units. Pass in Foundation Degree in a science related area with an overall mark of 55% in level 5 modules. Applicants will be considered for year one entry only. Teaching and learning will be through lectures, seminars, practical classes in a Diagnostic Imaging suite on campus as well as professional practice placement periods in Diagnostic Imaging departments. A range of assessment will be used including computer based assignments, case studies, completion of a portfolio, practical tasks and written exams. These will be both formative and summative in nature throughout the course. Given the requirement on the Faculty to stay within the DHSSPS (NI) limits, some element of control is necessary to ensure that inward transfers do not undermine the achievement of target numbers which is managed through the admissions process. Therefore, due to the nature and structure of the programme, exemptions and transfer are very unlikely, however each case is determined individually. There are many employment opportunities for Diagnostic Radiography graduates within the National Health Service, in private medicine and in companies concerned with the manufacture and sale of Radiography equipment and/or services. There are also many research opportunities for suitably qualified graduates both at this university and elsewhere. Further information regarding careers in Radiography may be found at http://www.sor.org/about-radiography/career-radiography; http://www.nhscareers.nhs.uk/ and http://radiographycareers.co.uk/. Periods of Professional Practice Placement are scheduled at regular intervals throughout the course enabling you to develop your technical imaging skills, as well as patient care and communication skills. In total you will complete 40 weeks of clinical experience across the duration of the programme, see schedule below. Elective placement in final year enables the opportunity to participate in placement abroad and participate in schemes such as Work the World which is endorsed by the Society & College of Radiographers. SEMESTER 1 –Sept/Oct –end of Jan –commences with 8 weeks academic study followed by 5 weeks Clinical Placement Twowhich commences mid Nov until end of Dec.
Approved by the Health and Care Professions Council (HCPC) for the purpose of providing eligibility to apply for registration with the HCPC as a radiographer. Approved by the Society and College of Radiographers (SCoR). Additional costs include - AccessNI Check, Health Screening, Membership of Society of Radiographers, Placement Expenses, Uniforms. Uniforms – as part of your course, you will be required to purchase a uniform during the first week of the semester. 2017/18 costs were approx. £100. Membership of Society of Radiographers – You will be required to join the Society of Radiographers. The cost of student membership will cost approximately £100 for the three years. Placement Expenses – students may incur expenses during periods of placement associated with costs of travel and accommodation. Some placements, organised as part of Elective experience may be outside Northern Ireland and will incur additional costs.